With the number of things we take with us from point A to point B, it is sometimes a wonder we can keep track of everything. 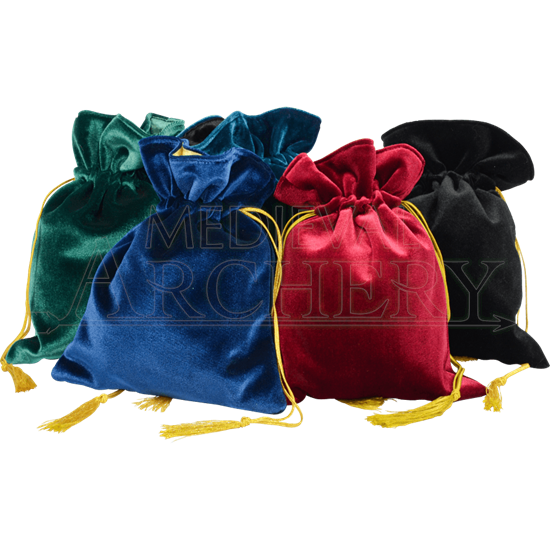 Our Velvet Drawstring Pouch is perfect for carrying your belongings in style! This high-quality velvet pouch comes in many colors and is lined with satin. The lining color may vary from bag to bag. Our sleek pouch features gold tassel drawstrings which help keep your items secure when going from place to place. Whether you need to carry your phone, wallet, or keys, this velvet drawstring bag is an ideal match for many outfits or ensembles. Pair this bag with your favorite LARP costume, medieval reenactment outfit, or your current style and carry your gear with confidence.